An abridged version of The Chinese Orange Mystery/Murder appeared in the popular short fiction magazine Redbook (June, 1934). In October, the magazine printed one of the better Queen stories, The Mad Tea Party, alongside a story by F. Scott Fitzgerald, and interview with former president Herbert Hoover. There is a very interesting twist in this story. A man has gone missing (at his Long Island estate), and suddenly clues begin appearing. Not the clues of a dying man, but clues by someone playing some sort of a game. Why are they playing this game? Does the kidnapper want to be caught? If an anonymous witness knows the identity of the kidnapper, why not write the name on a note, instead of leaving opaque clues? Ellery finally puts the clues together and reveals the kidnapper, who confesses to murder and reveals where the body is buried. Fine. But who left the clue s for Ellery to decipher? Turns out, Ellery himself was responsible for the clues. He devised them to play psychological games with the murderer: he knew who did it, he just wanted to find out where the corpse was hidden. The ethics of entrapment, apparently, be damned. 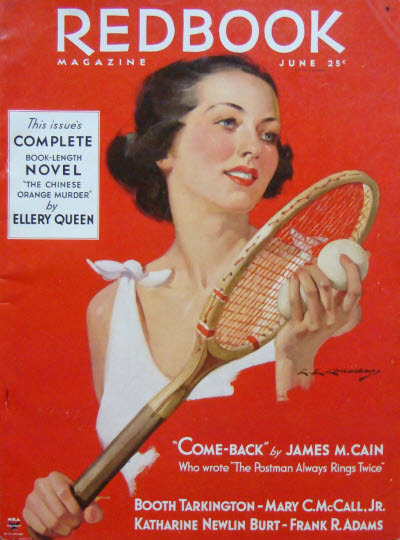 By the end of 1934, the cousins collected their nine published short stories, from self-published to published in Redbook, and one unpublished story, in the book The Adventures of Ellery Queen. This was their first short story compilation, and would be joined by several other over the years. This one, of course, was adapted — and very neatly too — on the Levinson-Link series with Jim Hutton. The touch the writer gave the script was that all the characters, the suspects, had the last names of famous mystery writers. This story, Francis Nevins said, was Fred Dannay’s favorite of all thier short stories.